Akron native and former U.S. Representative John F. Seiberling (1918–2008) grew up on his family’s estate overlooking Ohio’s Cuyahoga River Valley. Within his lifetime, Seiberling would become a leading player in the movement to protect the natural environment and help transform his childhood playground into the federally protected Cuyahoga Valley National Park. A Passion for the Land begins with a fast-moving narrative of Seiberling’s early life and a vivid description of the physical environment that stimulated his lifelong interests in nature and wilderness. Author Daniel Nelson provides a detailed examination of the congressman’s role as a dedicated environmentalist, covering Seiberling’s efforts to pass path-breaking legislation during the 1970s and the equally important period of defensive activity during the 1980s. Seiberling’s successful bipartisan campaign to protect the Cuyahoga Valley became a stepping-stone to other important conservation efforts. Working with like-minded legislators and activists in the expanding environmental movement, he used his increasingly influential position in Congress as chair of the House Subcommittee on Public Lands to foster urban parks, transform Alaska, and make wilderness protection a hallmark of the new approach to public lands management. The result was the creation of 100 million acres of parks and refuges in Alaska and millions of acres of protected wilderness in national forests. 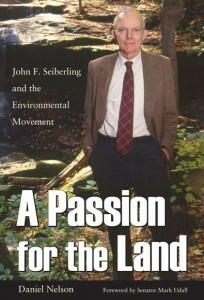 Based largely on unpublished correspondence and other previously unused materials, A Passion for the Land concludes with a review of Seiberling’s ongoing involvement in environmental affairs following his decision to retire from Congress in 1987. AuthorDaniel Nelson is emeritus professor of history at the University of Akron and former director of the University of Akron Press. He has authored many books, including Northern Landscapes: The Struggle for Wilderness Alaska and American Rubber Workers & Organized Labor, 1900–1941, as well as several articles and book reviews in national publications such as Journal of American History, Journal of Policy History, Ohio History, and Alaska History.